When household incomes are not sufficient to pay cash for big-ticket items such as homes and cars, people borrow money and promise to repay the loans. On a macro level, household debt can contribute to economic growth by increasing consumer expenditures on goods and services. For instance, household expenditures financed by cashing in on home equity played a significant role in the U.S. economy's growth rate in the early 2000s. However, the financial crisis of 2007–08, the U.S. subprime mortgage crisis of 2007–09, and the Great Recession (GR) revealed the danger of excessive household debt. Since the end of the GR, monitoring and controlling household debt levels have become important functions of central banks and regulatory agencies. 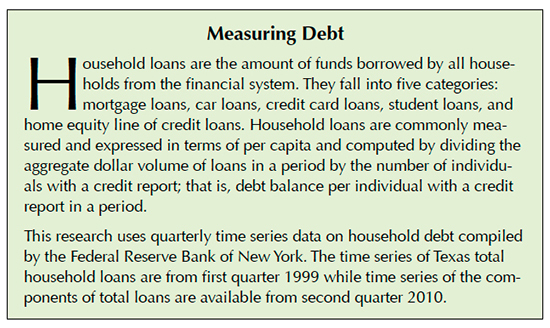 To perform these functions, more data on household debt balances have been compiled and are now available. The Real Estate Center at Texas A&M University has an ongoing research program to monitor Texas household loans with a focus on mortgage loans because these account for the majority of household loans. Here is what the research found. 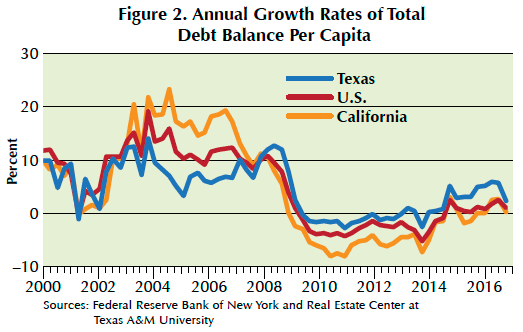 Texas per capita debt balances have been historically smaller than the nation's mainly due to smaller mortgage loans, a consequence of lower average home prices in Texas. 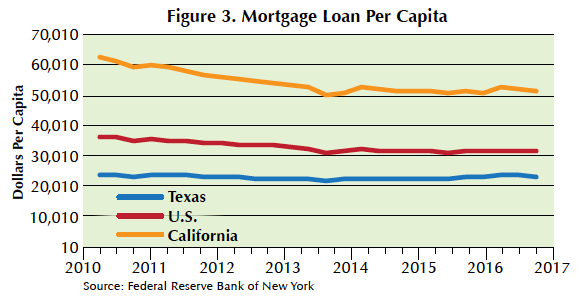 Mortgage debt per capita in both Texas and the U.S. have trended downward since the end of the GR, probably attributable to the Dodd-Frank Act. 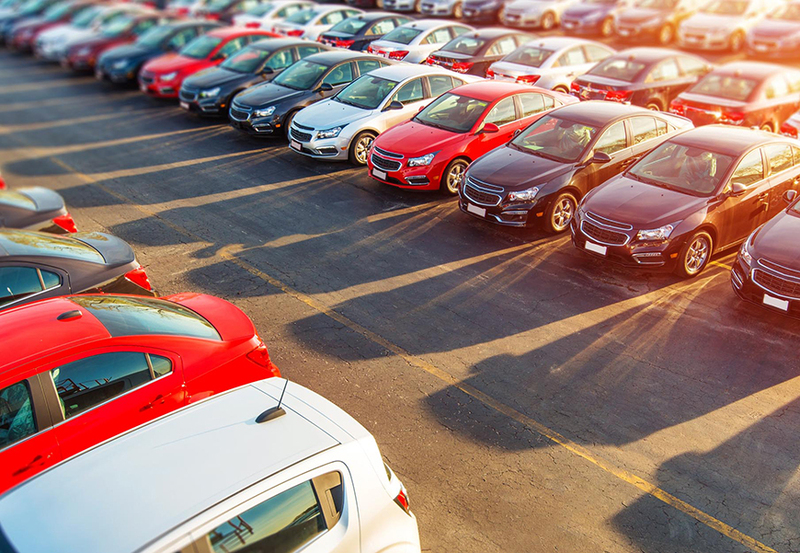 Taking advantage of lower mortgage loans, Texans have been using their borrowing capacity on cars, resulting in higher-than-national-average car loans. Lower debt balances enabled Texas households to suffer less in the GR and weather the financial storm of 2007–09 better than the rest of the U.S. Historically, Texas' average levels of per capita total household loans have been smaller than the nation's since debt data series have been available (Figure 1). 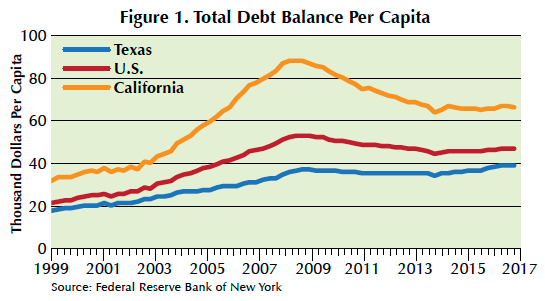 Texas had a per capita total debt balance of $18,010 in first quarter 1999 compared with $21,470 for the nation and $31,760 for California. The state's per capita total loans increased by 99.4 percent from first quarter 1999 to first quarter 2008 when Texas, like the rest of the nation, took advantage of low-cost loans engineered by the Fed to help the U.S. economy recover from the recession of 2001. However, Texas' borrowing growth rate was less than the 177.1 percent for California and the national average of 142.5 percent over the same period. Texas reached its pre-GR borrowing peak of $37,170 in fourth quarter 2008 compared with the nationwide peak of $53,040 in third quarter 2008 and California's peak of $88,010 in first quarter 2008. In the aftermath of the GR, the state's per capita total loans changed little due to risk-averse lenders and borrowers and more stringent borrowing rules implemented by the Dodd-Frank Act (Figure 1). Texas per capita total debt increased 4.4 percent from its peak level in fourth quarter 2008 to $38,800 in third quarter 2016, the last quarter for which data is available. The nation's per capita total debt fell 12.1 percent from its peak level in third quarter 2008 to $46,600 in third quarter 2016 while California's per capita total debt decreased by 25 percent from its pre-GR peak to $66,020. Higher growth rates of household loans were blamed for the financial crisis of 2008. But Texas experienced lower-than-national-average growth rates of per capita total loans before the GR as well as smaller decline rates during the GR (Figure 2). Texas' per capita mortgage loan fell from $23,999 in second quarter 2010 to $23,300 in third quarter 2016 (Figure 3). Over the same period, the U.S. per capita mortgage loan fell from $36,339 to $31,500 while California's per capita mortgage loan decreased from $62,529 to $51,160. Mortgage loans account for the largest category of household loans in both Texas and the U.S., but Texas' share of mortgage loans in total loans has been smaller than national averages. 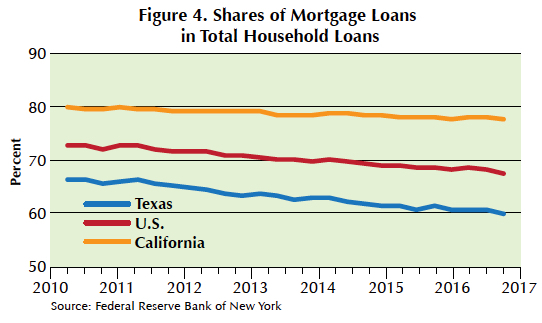 Texas' share of mortgage loans as a percentage of total household loans fell from 66.4 percent of total loans in second quarter 2010 to 60.1 percent in third quarter 2016 (Figure 4). The nation's share of household mortgage loans decreased from 72.9 percent to 67.6 percent while the corresponding share for California fell from 79.8 percent to 77.5 percent over the same period. Texas' lower levels of mortgage loans and smaller shares of mortgage loans are mainly due to lower-than-national-average home prices in Texas. 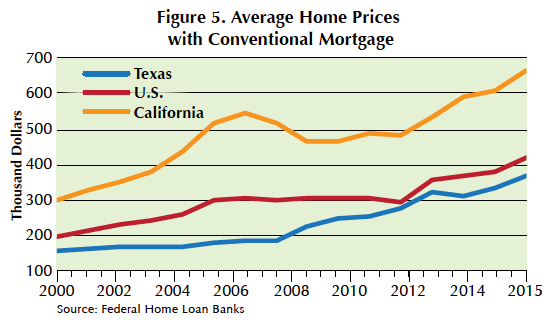 Historically, Texas home prices have been lower than national averages, and since 2000, the state's average home price with a conventional mortgage loan has been 78 percent of national averages (Figure 5). 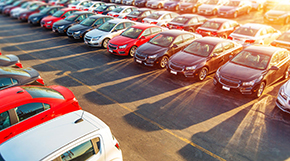 Smaller mortgage loans have enabled Texans to allocate more of their borrowing capacities for purchasing cars. 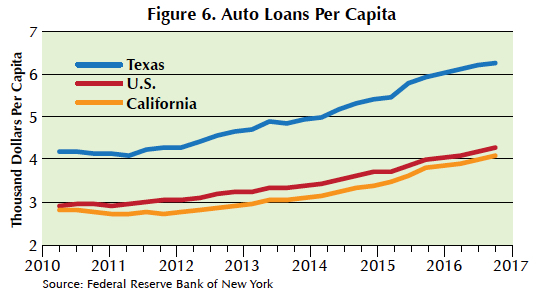 Texas' per capita auto loan in second quarter 2010 was $4,176.6 compared with $2,932.1 for the U.S. and $2,835.3 for California (Figure 6). After the U.S. economy recovered from the GR, Texas' per capita auto loan rose to $6,250 in third quarter 2016, a 49.6 percent increase from second quarter 2010. Over the same period, per capita car loans for the U.S. increased 46 percent to $4,280 while California's rose 44.2 percent to $4,090. Credit card loans have also been blamed for the 2008 financial crisis. 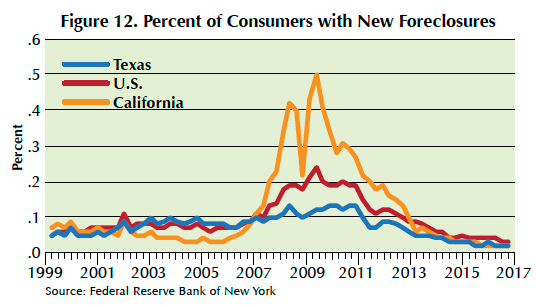 However, Texas consumers managed to maintain lower-than-national-average levels of credit card debt (Figure 7). While auto loan balances have been trending upward in both the state and the nation during the recovery from the GR, credit card balances took a downward trend that continued until early in 2014 and since then have trended upward. 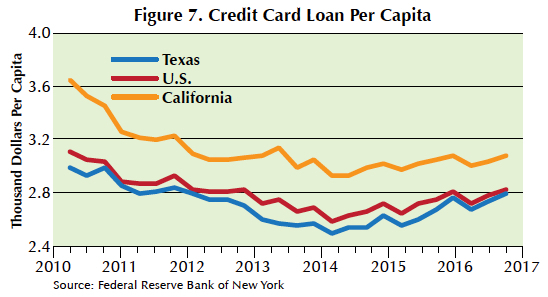 Texas' per capita credit card loan fell from $2,991.7 in second quarter 2010 to $2,490 in first quarter 2014 and since then has increased to $2,790 in third quarter 2016. The nation's per capita credit card loan decreased from $3,108.1 in second quarter 2010 to $2,580 in first quarter 2014 and since then has increased to $2,820 in third quarter 2016 while California's fell from $3,647.4 to $2,930 and then rose to $3,070 over the same period. About 59 percent of Texas students at four-year public and private institutions had student loans when they graduated in 2014. 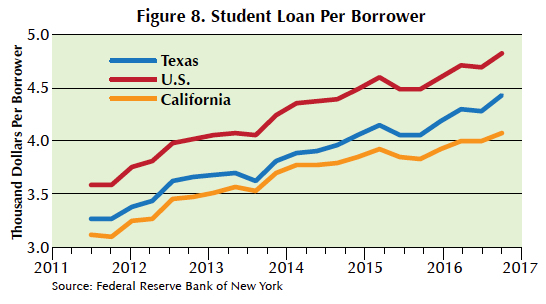 Student debt per borrower has been trending upward since data were available in 2011, but Texas students have managed to graduate with lower-than-national-average student loans (Figure 8). Average loan balance per Texas student in third quarter 2016 was $4,420, less than national average of $4,830 in the same quarter. Texas voters approved two amendments to the state's constitution in 2003 allowing financial institutions to offer home equity lines of credit (HELOC). The home equity loan is subject to several restrictions. The most important one is that the total of all loans secured on a home cannot exceed 80 percent of the home's fair market value. 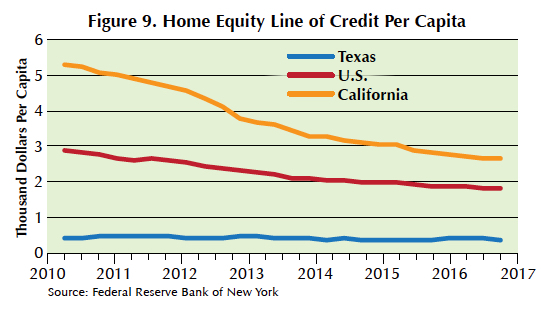 Similar to mortgage debt balances, Texans have maintained lower levels of HELOC compared with national averages and California's per capita HELOC (Figure 9). Lower levels of loans can increase the ability of borrowers to repay their loans and weather financial storms. Not surprisingly, Texans suffered less than the rest of the nation in the GR because they had lower levels of debt. 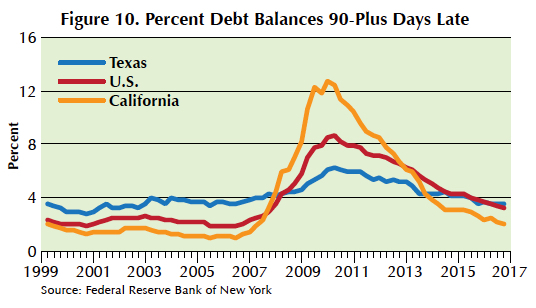 Before the GR, Texans had higher-than-national-average percentage of debt balances 90-plus days late. During the GR, the highest percentage of late debt balances was 6.2 percent compared with 8.6 percent for the nation and 12.5 percent for California in first quarter 2010 (Figure 10). 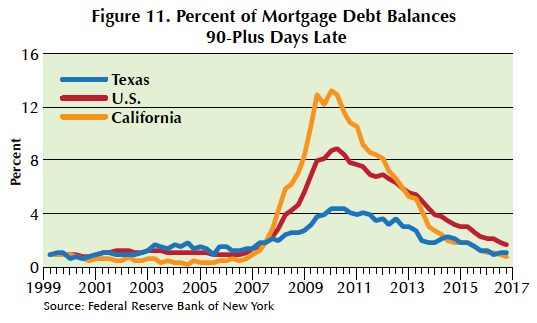 The maximum percentage of mortgage debt balances more than 90 days late in the same period for Texas was 4.4 percent compared with a national average of 8.9 percent and 12.9 percent for California (Figure 11). In the GR, the maximum percentage of consumers with new foreclosures for Texas was 0.13 percent compared with 0.24 percent for the U.S. and 0.50 percent for California (Figure 12). Lower home prices have allowed Texas households to maintain lower debt burdens. Because of this, Texas households weathered the financial storm of 2007–08 better than the rest of the U.S.
Dr. Anari (m-anari@tamu.edu) is a research economist with the Real Estate Center at Texas A&M University.